Shane Gehlert “I Like Guns” Painting! An artist mate of mine who accompanied us on the trip to Cambodia to film the “I Like Guns” music video, has just released a new painting and art print – the work is aptly titled “…and no one shoots at me cause I got a gun”! 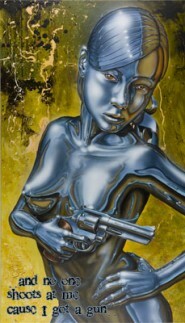 Shane is an Australian artist and a good mate of mine and he has a unique way of painting and is famous for his chrome artworks. You will also get to know him a little better when you see him in the “Making of I Like Guns” video. This latest piece is inspired by out trip to Cambodia and i think it’s pretty cool so for anyone who is interested in art, you can look at it on Shane’s website here. If you’re in the Orange (NSW, Australia) region i will be there this Saturday for the gun show so come and say G’day. I will also be performing with The Lees on Easter Thursday at the Walgett Sporting Club, and also on Easter Friday at the Lightning Ridge Bowling Club! Plus the Great Goat Races will be there of course! If you haven’t been you need to get down there at least once! My daughter Raechel did some reporting last year when we were there; you can check it out here.